Orly High on Hope | Light Your Nails! Short post tonight, I’m taking my boyfriend out for a fish based dinner. Yup, I’m taking him out. He doesn’t know yet but I am sure he’ll love it. Anyway, here’s Orly High on Hope, which was released in 2013 with the Hope and Freedom Spring collection. It’s quite an unusual shade for a Spring collection I would say! It’s a dark blue base filled with pink small flecks. Good thing that the pink shimmer also translates to the nails and doesn’t stay in the bottle, which is the case sometimes. Application is incredibly easy, removal a bit less because of those flecks. Oggi post veloce perchè devo prepararmi per cenare fuori. Porto il mio compagno fuori per una bella cena di pesce. Lui ancora non lo sa ma sono sicura che apprezzerà molto! Lo smalto che vi mostro è Orly High on Hope, uscito nella primavera 2013 nella collezione Hope and Freedom. Devo dire che è una tonalità piuttosto insolita per una collezione primavera! E’ un blu scuro pieno di scagliette rosa, che per fortuna si vedono bene anche sulle unghie e non rimangono solo in boccetta. La stesura è una favola, la rimozione un po’ meno per via di questi glitterini. 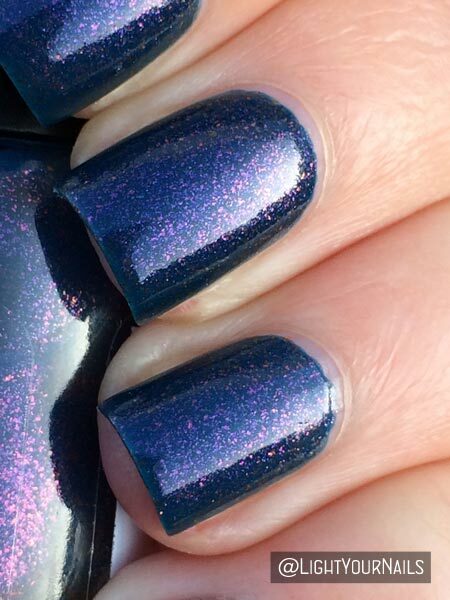 I had to share that macro shot because it really shows how beautiful Orly High on Hope is! So good when mainstream brands come up with something different than usual. Do you like High on Hope? Maybe you grabbed it back when it was released? Dovevo farvi vedere quello scatto in modalità macro perchè mostra veramente quanto è bello questo smalto! A voi piace? Magari l’avete preso quando è uscito? I love orly. Out of all the mainstream brands, they are the most innovative. I don't pay enough attention to their releases, bad of me. Oh, this is very pretty. Very nice indeed. Love the subtle yet noticeable pink flecks! I have this polish in my collection. I haven't worn it in ages, I'd forgotten how pretty it is! I know how it feels when we have too many pretties! This is the best kind of Orly shimmer! E non ti do torto! That's really beautiful! I don't remember quite when I discovered Orly, but I'll have to see if I have that or not. Love it. Ooooo I think I have one. I need to get it back out! It's beautiful. Thanks for the reminder! I am drooling over this shade, its so beautiful! Hope you and your boyfriend have a lovely dinner out!